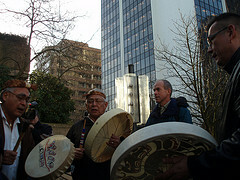 After more than a decade of legal preparations and 123 days in court, Nuu-chah-nulth Nations celebrated a major legal victory in November 2009. That’s when BC Supreme Court Justice Nicole Garson ruled that Nuu-chah-nulth First Nations have an Aboriginal right to harvest and sell all species of fish found within their territories. “At contact, the Nuu-chah-nulth were overwhelmingly a fishing people,” she wrote in her 307-page judgement. “They depended almost entirely on their harvest of the resources of the ocean and rivers to sustain themselves.” She added that Nuu-chah-nulth people were able to prove a long history of trading and selling fisheries resources in their case against Canada and British Columbia. “Today this decision confirms what we’ve known all along. We have been stewards of our ocean resources for hundreds of generations, and the Government of Canada was wrong to push us aside in their attempts to prohibit our access to the sea resources our people depend upon,” said NTC President Cliff Atleo, Sr. Since time immemorial, Nuu-chah-nulth people have built our societies, economies, and culture around fishing. After Confederation, Canada encouraged our ancestors to remain fishing people by allocating small fishing stations as reserves, while denying the larger land claims of our Nations. Over the next hundred years, regulations by Canada diminished and excluded Nuu-chah-nulth participation in the West Coast fishery. Attempts to reach negotiated settlements through the treaty process produced few results. In June of 2003, Nuu-chah-nulth plaintiff Nations filed a Writ of Summons against Canada and British Columbia seeking reconciliation. The claims of the Nations were based on Aboriginal rights to harvest and sell sea resources, Aboriginal title to fishing territories and fishing sites, and the unique obligations of the Crown arising through the reserve-creation process. Six years later, Mme Justice Garson ruled that Nuu-chah-nulth Nations have a right to fish and sell fish within our territories. While Mme Justice Garson’s decision was a clear victory for Nuu-chah-nulth, she was also clear in her ruling that this right to harvest and sell fish is not an unrestricted commercial right. Implementation will require negotiations with the governments of British Columbia and Canada. Today Nuu-chah-nulth Nations involved in the case are attempting to engage Canada (through the Department of Fisheries and Oceans) in meaningful negotiations. Concurrent to this process, Canada is appealing the ruling to the Supreme Court of Canada. For the latest news on this case, please see our timeline.